The Session Description Protocol (SDP) conveys information on media streams in multimedia sessions in order to allow recipients of a session description to participate in the session. It is mainly used in inter-network but it can also describe conferences in other network environments. Multimedia sessions are defined as a set of media streams existing only for some duration of time. They can be various while the time duration (when the session is active) does not need to be continuous. SDP has two main purposes: Once it is a mean to communicate if the session exists, and it also conveys information for allowing participation in the session. Session Description: It is a clear format that conveys adequate information in order to make participation possible in a multimedia session. Moreover, SDP is applied for negotiating between endpoints of media type, format, and all associated properties. It can be extended to be able to support new media types and formats. SDP often used in conjunction with RTP, SIP or as a standalone format that is employed for describing multicast sessions. SDP includes the media type (video, audio, etc), the transport protocol (RTP/UDP/IP, etc), and media format (video, MPEG video, etc). In case of IP multicast session the follows are also conveyed: multicast address (destination address of the multicast stream) and transport port (destination port of the multicast stream) for media. 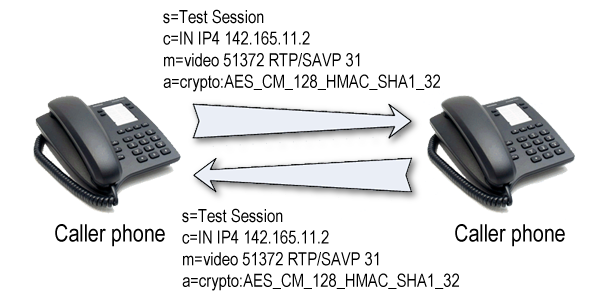 For IP unicast sessions remote address for the media and transport port for contact address are also conveyed. They depend on the media and transport protocol defined. Sessions can be bounded or unbounded in time and can be active only at specific times. In this way SDP can include the start and stop times that bound the session and for each bound, SDP can convey repeat times. This information is globally consistent. With SDP you can create public sessions and private sessions, as well. Private sessions can be created by encrypting the session description. The method of encryption depends on the mechanism that is used for conveying SDP. These private sessions can be used for conveying encryption keys required to decode the media in a conference. Further information about sessions can be gained from session descriptions. This information then allows to decide if the participation in a session is required or not. SDP can contain further pointers in Universal Resources Identifiers (URIs). SDP supports a categorization mechanism for sessions that can be automated. The SDP specification recommends to use ISO 10646 character sets in the UTF-8 encoding therefore many languages are allowed to be represented. SDP can also allow other character sets such as ISO 8859-1 to be used when desired. A series of attribute/value pairs describes a session in a way that there is one per line. Values can be ASCII string or sequences of types separated by spaces. Optional fields has an "*".